If you’re anything like me, you love to listen to your favorite music on long trips. There’s just something about cruising along with the right music to make your trip that much more enjoyable! With our tablets, phones, and MP3 players today, an absolutely massive library of music is available right at our fingertips. Additionally, today most aircraft panels have added a 3.5 mm source input that ties together with an audio panel, so it should be a no-brainer how to connect the two together, right? If you said “with a cable”, then boy o’ boy are you wrong! Believe me, nobody wants to add another cable to their flight deck if they don’t have to. That’s just one more thing to get tangled up in or remember to pack. But don’t worry because I’ve got a great, low-cost solution for you. Enter the MPOW Streambot Mini Bluetooth Receiver. One of my buddies actually turned me on to this little device when we first bought our Lance. Up until that point, I had been using the shortest cable that I could find to connect an Apple iPod to listen to my music, but even still that cable was 3 feet long. I was frustrated because I don’t deal with clutter well at all. He told me all about the device he was using in his Lance, and even showed me where I could get one. I went online, fully expecting this thing to cost $50 or better, but I was extremely surprised to find that (at the time) it was only $20! I quickly bought one, and awaited for it to arrive. Amazon is really good with shipping, so I didn’t have to wait long. The receiver arrived in a small unassuming box. After opening it up, I really got a sense of how small it was. The dimensions on the device are only about 2 inches long by about 1 inch wide. Don’t let the small size fool you though, the thing worked like a dream! With only a couple of buttons on it, even a dummy like me could figure it out. I removed it from the box, and set about charging it with the included USB charging cable. It only took about an hour to fully charge the receiver, and I was up and running in no time. Pairing the device to my iPhone and iPad was extremely simple. Just hold down the multifunction button and Voilà! One of the other nice accessories included with the MPOW is the 3.5 mm metal audio adapter. Once plugged into the receiver and your audio source, it barely protrudes into the cockpit at all. It stays tucked out of the way, clutter free, just like I like it. MPOW advertises up to 10 hours of play time with 120 hours of standby time. I would believe that as the battery has easily lasted longer than any trip I’ve ever taken it on. 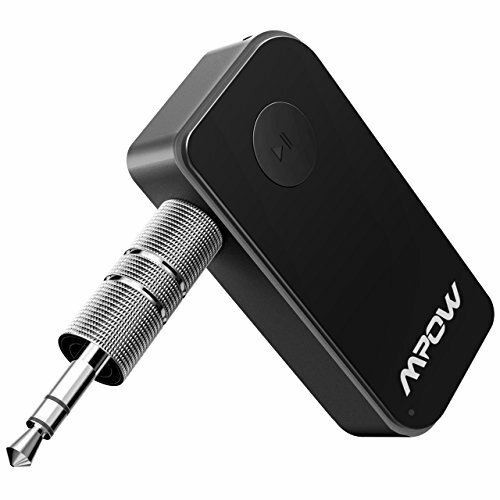 These days, MPOW has several versions of this device available, but you can still purchase the MPOW Streambot Mini Bluetooth Receiver at a variety of locations. For those of you like myself though, here’s where you can get it at Amazon.com. Because of its price point, its reliability, and its ability to de-clutter my cockpit, I give this product two thumbs up!